When life gets tough, sometimes the tough need to take a break to ride some roller coasters. 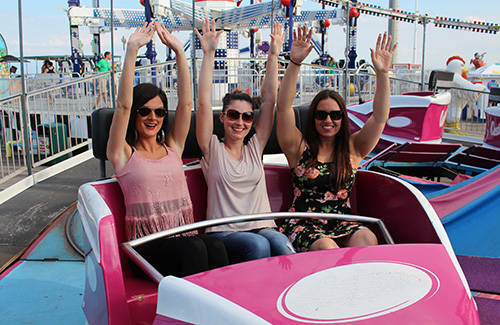 If you’re looking for a place to go for unbeatable fun things to do with family and friends, you'll want to visit one of the best family amusement parks in New Jersey – Casino Pier & Breakwater Beach. 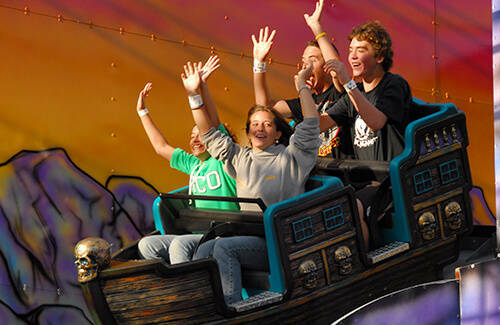 We are THE theme park that houses exciting attractions, roller coasters, and plenty of fun for everyone. It doesn’t matter if you're a kid or a kid at heart; our NJ family amusement park has everything for visitors aged 1 to 103! 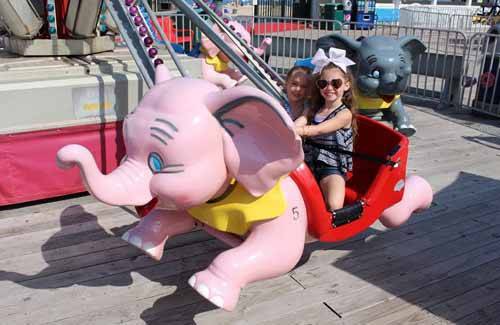 Our property is packed with games, rides, arcades, food stands, water park attractions, and a nearby beach making it one of the best places to visit in the summer. 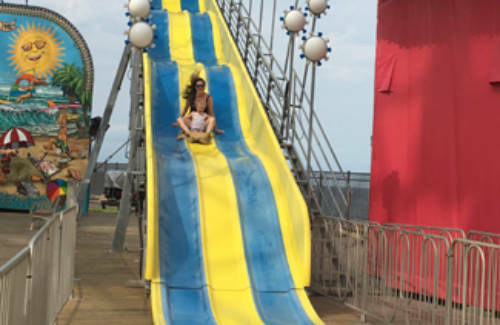 You will never run out of things to do at Casino Pier & Breakwater Beach. 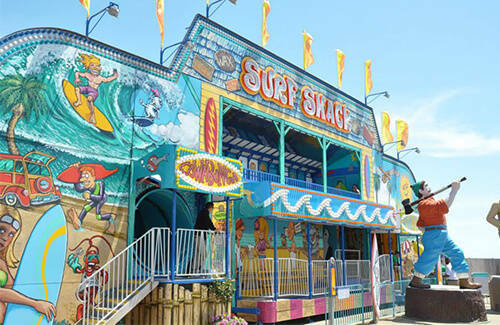 Surf Shack: A multi-level walk-through funhouse perfect for the beach bum in all of us. 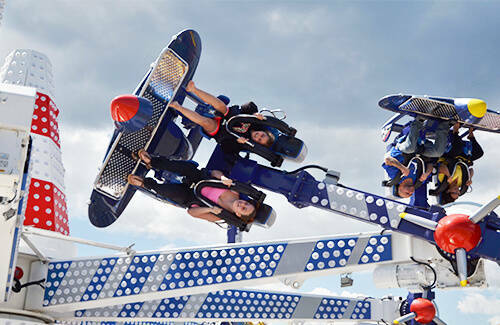 Shore Shot: The newest addition that double launches a thrill unlike any other. Tickets will NOT be accepted at a ride. If you have tickets from previous years, you must trade them in for SURF card credits at the Guest Relations Office. The trade value: 1 SURF credit for every 2 tickets. Our Indoor Scrambler suspends riders in spinning cars and experience centrifugal force, while spinning along two separate axes. Riders are seated in small carriages clustered together and connected by beams at the top to a central point. Special to our Centrifuge, we play music, have strobe lights, smoke, and multicolored lights during the ride! We're excited to have this ride back after losing in Superstorm Sandy. 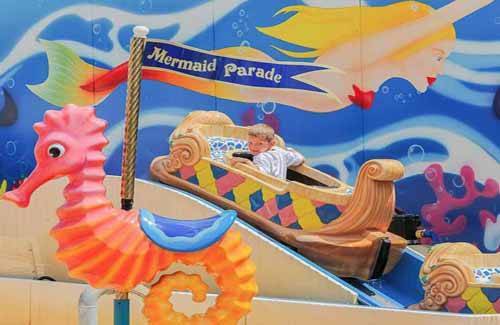 Take an enchanting ride with mermaids as you float through under-the-sea theming. The kiddie mermaid designed flumes slide along over 130 feet of track. Vehicles: total of 6. Each vehicle seats 2. 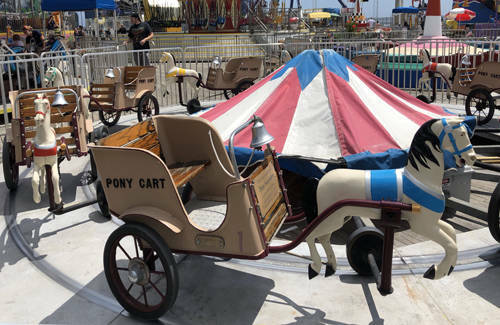 A new kiddie ride for the pier! The Elephant Express has six 2 seater elephant designed vehicles. Each elephant contains a lever which allows the rider to control how high they want to fly! 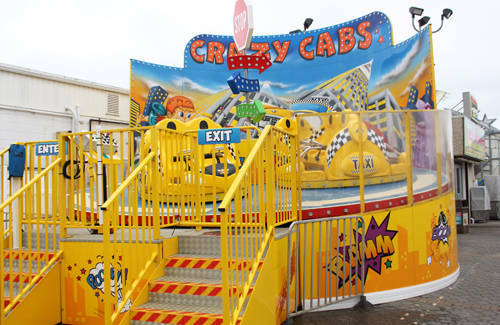 It's time to get "crazy" in a whole new way with our new ride – Crazy Cabs! Our Crazy Cabs ride will have you spinning clockwise, counter-clockwise on an angled motion-based platform while you’re laughing and holding on tight with family and friends. Perfect ride for the whole family! Riders will embark upon an acrobatic airplane journey filled with banks, loops, dives, and weightlessness that will test even the most experienced thrill seekers. “Pilots” will experience accelerations of almost 3G while flying right-side up and upside down at a height up to 25 feet. Loose articles must be secured or left with a non-rider. This ride exhibits strong forces, motion, and spinning, and is not recommended for persons with motion sickness or prone to injury. 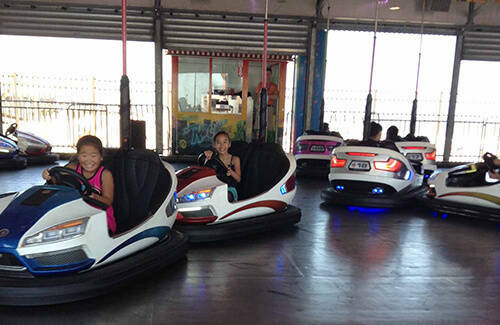 No visit to the boardwalk is complete without a ride on the Bumper Cars. Drive around, listen to the music, and enjoy the only place where you can bump cars without exchanging insurance information. Riders are seated on a giant circular disc facing outwards and experience dizzying thrills as the disc spins around while swinging back and forth on a giant half-pipe track. 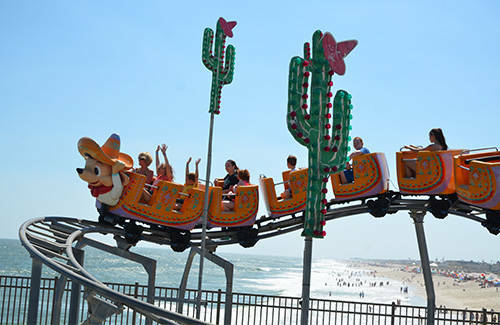 The greatest thrills come at the top of the track, where riders experience a whipping sensation as spectacular views of the beach, pier, and ocean whizz by. Loose articles must be secured or left with a non-rider. This ride exhibits strong forces, motion, and spinning, and is not recommended for persons with motion sickness or prone to injury. 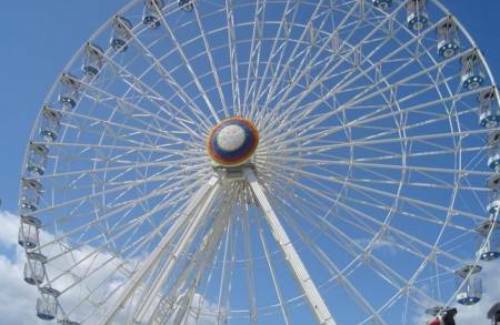 A 40 meter Ferris Wheel stands 131 ft tall & bright on our expanded pier. 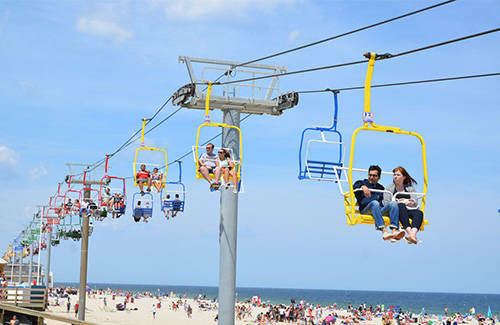 Manufactured by Technical Park, 34 gondolas seating 6 passengers will offer breathtaking views of the Jersey Shore. One gondola will offer wheelchair accessibility. Those with a fear of heights should refrain from riding. A Gerstlauer manufactured Euro-Fighter roller coaster with a 72-foot vertical lift and beyond-vertical drop. The sensational first drop of 97° is just the beginning. Tracking at 45 miles per hour, passengers will glide the 1,050-foot coaster track which includes a vertical loop, an Immelman turn and a heartline roll during its course. This ride exhibits strong G-forces, motion, and spinning, and is not recommended for persons with motion sickness or prone to injury. This family favorite seats riders in a long row. After rocking back and forth, the speed increases and riders are spun to exciting heights. The speed gives the sensation of floating after the boat crests the top and comes back down. Once you think you are done, you are then spun in playthe opposite direction! 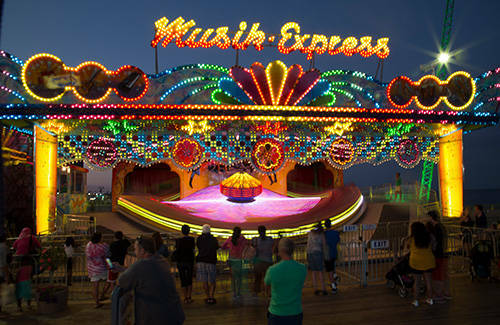 The Musik Express seats up to 60 riders in 20 cars which accelerate in a circular train up and down the track’s hills and through a tunnel as Casino Pier’s DJ plays the latest popular music though a heart-pumping sounds system. The ride also features lighting effects, sirens, fog machines, and encourages riders to scream to go faster. Once riders reach their pinnacle of excitement, they do it all over again, backwards! 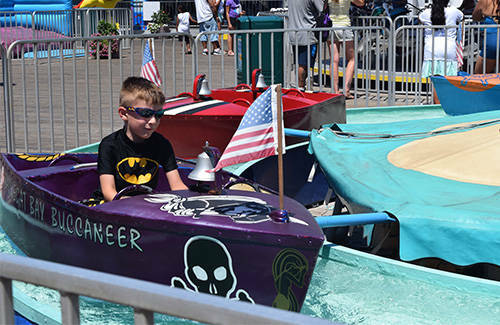 Enjoy this family fun, Pirate-themed roller coaster. This ride has a unique spiral-lift before dropping you into the Pirate Adventure of dips, turns, and drops. Afterwards, be sure to visit the Photo Cove to view a stunning photo of your adventure. Ramped access via ride entrance. The Pirate’s Hideaway made its debut in 2007, although the ride is new it was modeled after its predecessor, the Wizards Cavern. Prior to the Wizards Cavern theme, the ride was known as the Love Bugs, which moved to Casino Pier from the famous Palisade’s Park. Ahoy, young Matey! The Captain has called you to complete this Pirate voyage. Walk your way through 4 levels of adventure including crossing swinging bridges, scaling the rope net, and climbing your way through the rope maze. At the end, slide your way to escape. Fun for all ages and parents are encouraged to accompany small children. 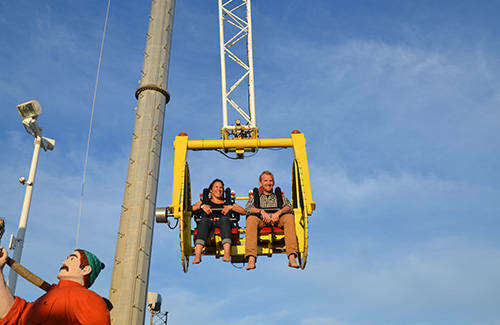 Shore Shot takes passengers on a double launch thrill like no other, rapidly propelling riders 125 feet up in the air at speeds up to 45 mph and then plunging back down at great speed. 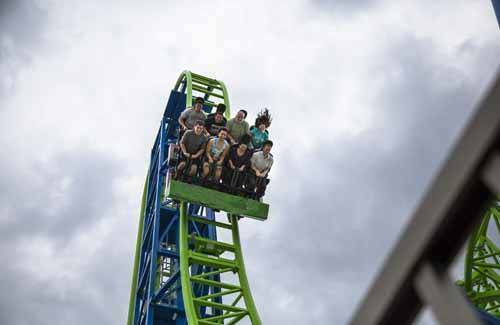 The Shore Shot launches 12 passengers through two cycles of positive and negative G-force experiences – back to back! Loose articles must be secured or left with a non-rider. 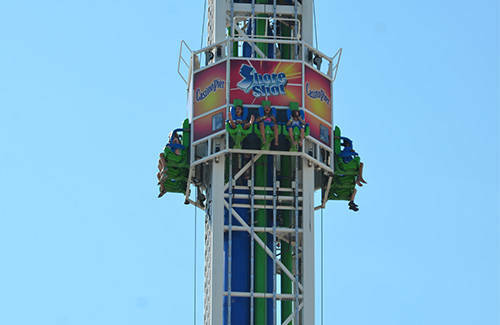 This ride is a high-speed free fall experience that includes sudden and intense acceleration, climbing and dropping. This ride is not recommended for persons with motion sickness or prone to injury. This tranquil ride gently takes you high above the Seaside Height’s beach and boardwalk. Enjoy the cool ocean breeze with great views of the Atlantic Ocean, Barnegat Bay, Seaside Heights, boardwalk stands and businesses. Both former MTV Beach Houses and the only view of the legendary MTV’s “Jersey Shore” house are noteworthy sights. $5 Round Trip / $3 One Way – Wristbands & Easter SURF Cards not valid. 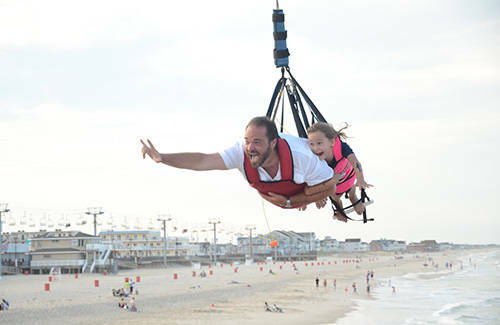 SkyCoaster offers the thrills of skydiving to anyone daring enough to soar out beyond our pier and over the ocean. Flyers will experience a rush of wind and a very exciting “ground rush” as they are dropped from 109 feet high and swiftly pass over the ground at 60 to 80 miles per hours. $30 Individual/$50 Double/$60 Triple – This is a separate admission and ride tickets cannot be used. Loose articles must be secured or left with a non-rider. Maximum combined weight of all flyers cannot exceed 850 pounds. 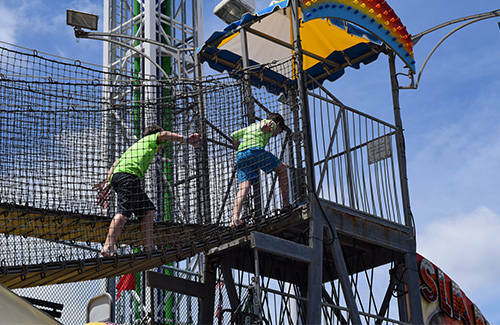 For the adventure seekers, this giant thrill ride spins you at speeds up to 70 mph, and takes you 170 feet into the sky. During the ride you stop on the very top and have the best view of Seaside Heights, the Atlantic Ocean and the surrounding area. While you sit up top, enjoy knowing that nobody for miles around has a better view or is higher than you! Then get ready to do the ride again… backwards! $20 per person – This is a separate admission and ride credits cannot be used. For the beach bum in all of us, this multilevel walkthrough funhouse geared towards families has exciting obstacles including a rotating barrel. Park your dune buggy, wear your sunscreen, and hang up your wetsuit, because the surf’s always up at this funhouse! 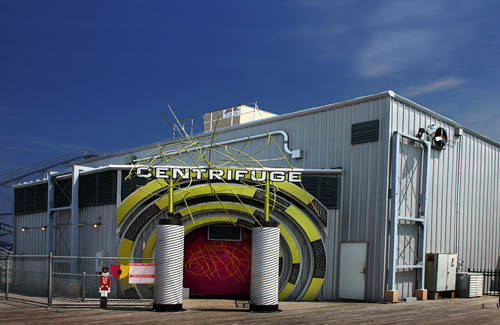 The newest addition to Casino Pier’s amusement park! Bring out your inner child and slide away! 42″ Minimum Height All Riders. 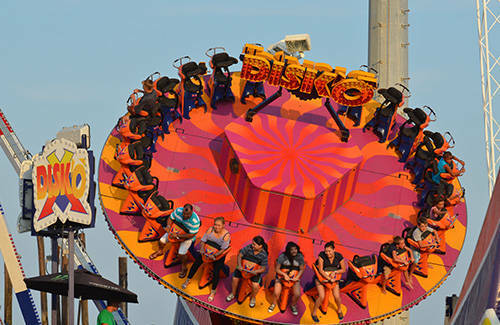 The riders are seated in a circle extended from a pendulum arm hanging down from the center of the ride. The ride begins to spin around in a circle while swinging back and forth. The greatest thrills happen as the ride continues to spin and goes upside down making a 360 degree revolution! Due to the design of the restraint system, large framed guests may not be permitted to ride. Fight back against the power of the Super Storm and show how Jersey Strong you are! 55″ Minimum Height All Riders. 77″ Maximum Height All Riders. This is the quintessential boardwalk amusement park ride. 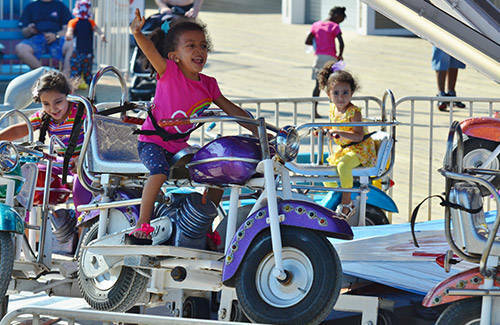 All ages love the twists, turns, spins, and thrills that the Tilt-A-Whirl offers. Fun for the whole family, challenge your group to see how many times the car will whip around the turns! Swings aren’t just for kids anymore. 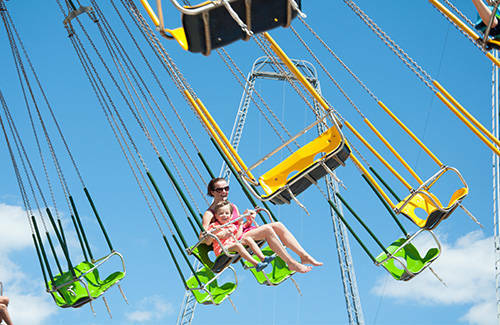 Enjoy views of the Atlantic Ocean while swinging around this fun for everyone ride. Riders in swings are suspended from a beautiful carousel that rises up high into the sky and spins so fast that the chairs swing out to the edge of the ride. Look down and around for fabulous views or admire the ride’s Venice Canals themed paintings and artwork. Adults aren’t the only ones who get to have fun at Casino Pier & Breakwater Beach. We’ve created a land of fun just for kids. 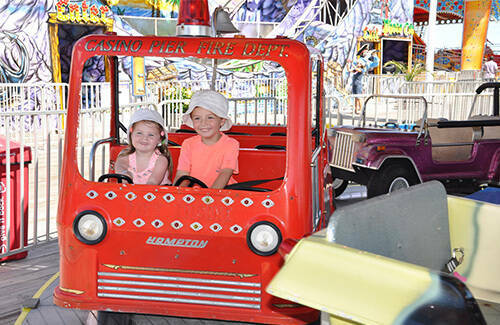 As one of the best kiddie theme parks in NJ, we offer a high level of fun for the little ones. 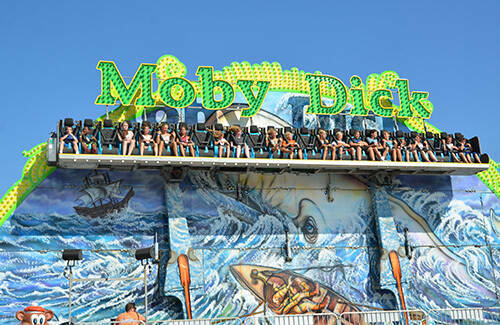 From boat rides to the Dizzy Dragon, kids of all ages will surely enjoy the rides we have for them. 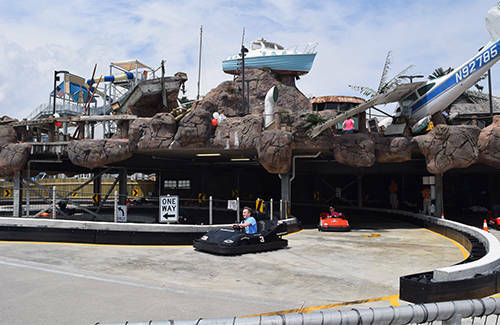 They can also play mini golf with friends, ride motorcycles, and have fun with Baja Buggy themed rides. 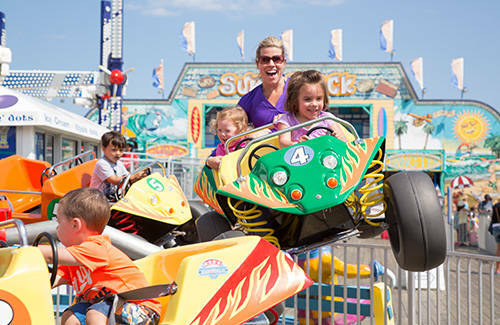 Casino Pier & Breakwater Beach has everything and anything for the family! Visit us today! Put on your captain’s hat, pull up anchor, and steer your boat through the calm waters of this ride. This ride is extremely popular with children who enjoy steering their wheels and ringing their bells. This classic ride offers a great photo opportunity as parents reminisce about riding the boats when they were children. A classic umbrella-top amusement park ride that offers a variety of cars and trucks for children to choose. This is the perfect ride for small children who are novice riders, the cars smoothly drive around the circular track. One ride on here and you too will feel like a dizzy dragon. 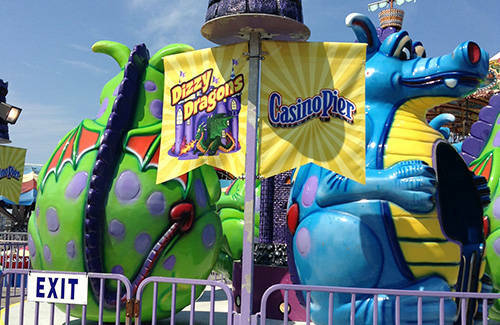 This family ride features 6 giant dragons, climb inside and hold on tight as the entire platform rotates. 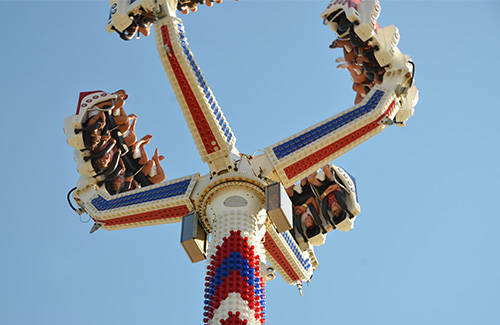 Riders have the additional option to manually spin their individual car using the center table grip – usually to the children’s delight and the parent’s dizzy fright. Enjoy this spicy family roller coaster with a South-of-the-Border theme. Inside a giant mouse roller coaster train, children love the thrill of the ride’s drops, twists, and turns, while parents enjoy the bulky comfortable seats and a full view of the ride. Jump Around is a Baja Buggy themed ride which features random jumping and bouncing motions. Manufactured by Zamperla, the Jump Around is designed for children of all ages. So kids buckle up and get ready for this fun new excursion! Only one adult permitted in each buggy. A classic umbrella-top amusement park ride that children absolutely love riding. Offering a variety of different color motorcycles to choose from, children eagerly climb onto their chopper. The ride is much more exciting than just driving in a circle, children delight in popping wheelies and unleashing their inner dare devil when they jump off a ramp then safely land on the other side! A classic and fun kiddie ride! Children can grab the reins of their own cart and pretend to guide their horse around a circular track. Horses even mimic the galloping motion as they bob back and forth. 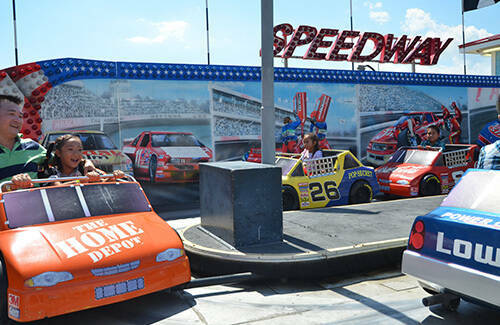 The Speedway offers NASCAR themed racecars which children can ride and have their parent’s join in. Race towards the finish line down the straight-away then enjoy the sensation of a whip while drifting around the fast sharp turns. Located on the Corner of Grant Ave and Ocean Terrace. Bring the family for some racing action! Navigate the turns, climb over the bridge and cruise through the tunnel. Cars are available in children’s size, adult size and two-seats for the young race car driver to be! $9.50 per person daily, $6 per person Monday & Wednesday Noon-6pm. $2 per passenger. Single Car: 54” minimum height for all drivers. Double Car: 54” minimum height for the driver. 36” minimum height to 48” maximum height to be a passenger (passenger tickets are discounted). 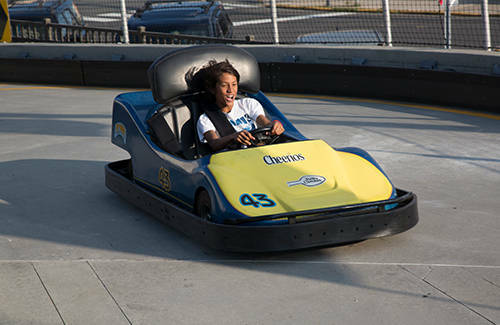 Single “Junior” Car: 48” minimum height to 54” maximum height (this car is sized for younger guests and operates on the same track during the same race as all other cars). 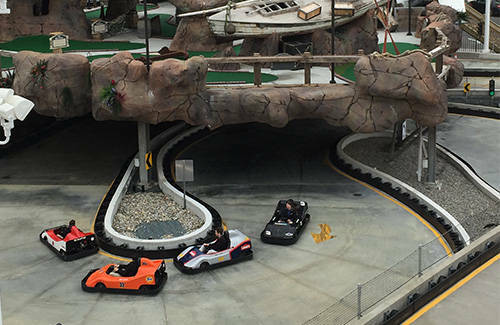 All Go-Karts are individually driver controlled – drivers must operate a steering wheel, gas pedal, and brake. 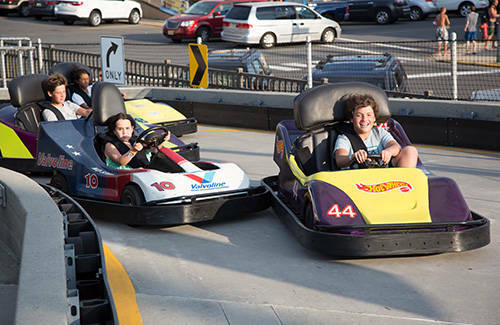 Go-Karts go up to 14 miles per hour and are not “Bumper” cars. Drivers who intentionally bump, cause accidents, drive dangerously, or do not have safe control of their vehicle will be removed from the race at the ride operator’s discretion. When signaled by the traffic lights or ride operators, all drivers must stop their cars until directed otherwise. Use of cell phones, cameras, or any hand-held devices during the race is strictly prohibited. If you would like a picture, please leave your camera with a non-rider. Hand-held devices can become hazards on the track and a safety hazard to all drivers. Casino Pier is not responsible for damage to any loose or lost articles. We are here for your safety and enjoyment. If you have any questions, please ask one of our team members. Ride operators will be happy to demonstrate proper use and safety of the Go-Karts upon request. 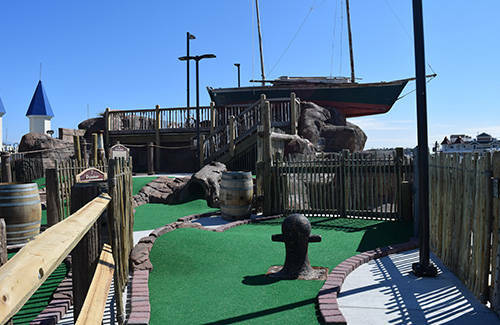 Putt your way through the course and take on an adventure of a lifetime as you discover mountain caves, learn of legendary pirate exploits, and traverse over footbridges and beneath cascading waterfalls! 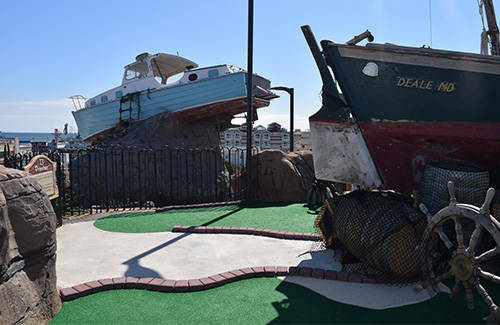 The accessible miniature golf course is nautical themed with traditional miniature golf fare. There are two 18-hole courses to choose from, the Privateer Course and the Buccaneer Course. Our manicured courses are specifically designed to provide maximum enjoyment for kids and adults alike. 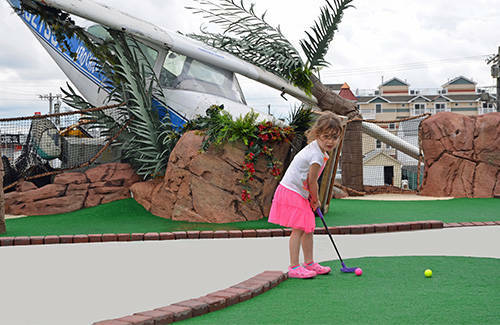 Smuggler’s Quay Adventure Golf is one attraction you do not want to miss during your visit to Casino Pier. Come discover the fun! 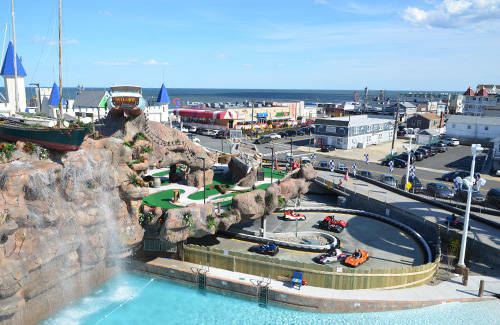 Situated on the street corner of Sherman Avenue and Ocean Terrace, Smuggler’s Quay offers incredible views of Breakwater Beach, Seaside Speedway’s Go-Kart track, the Atlantic Ocean, Seaside Height’s Boardwalk and the Casino Pier. The entrance is located next to the Go-Kart track on Ocean Terrace. Be sure to bring a camera to take a picture with all the boats that have run-aground on Smuggler’s Quay. Benches are available for those who would like to kick back and enjoy the cool ocean breezes while the children go play. We look forward to seeing who the best golfer is in your family! 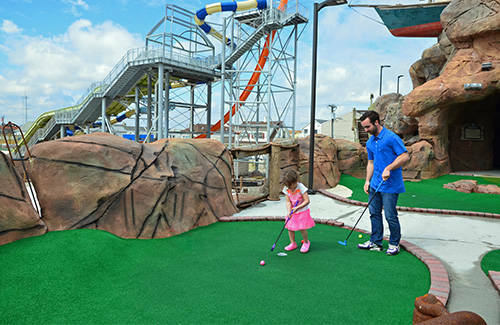 Family fun meets friendly family competitiveness at Wacky Rooftop Golf. 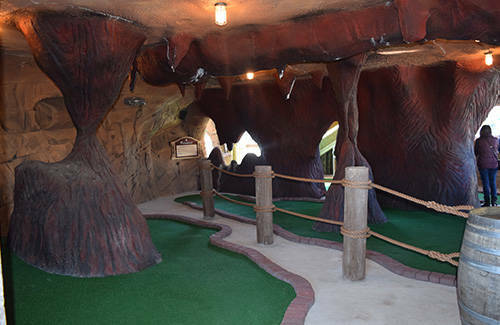 This 18 hole miniature golf course is themed with traditional miniature golf fare. From hitting your ball around the loopy-loop, to avoiding the windmill’s blade, this course offers thrills for golfers of all ages. 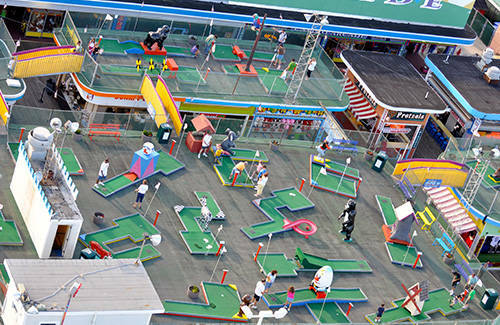 Easy enough for children to play, yet with obstacles to make it exciting for more experienced miniature golfers, Wacky Rooftop Golf is one attraction you do not want to miss during your visit to Casino Pier. 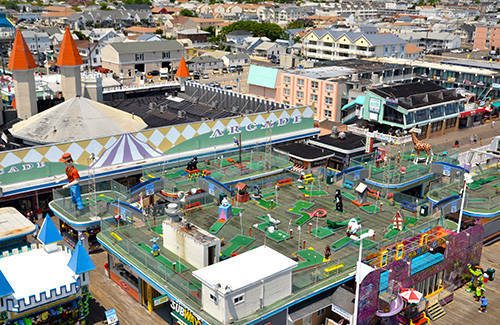 Situated on multiple rooftops between the Casino Pier Arcade and Amusement Park, the Wacky Rooftop Golf offers incredible views of the Atlantic Ocean, Seaside Height’s Boardwalk and the Casino Pier. The entrance staircase is located near the South Entrance to the Casino Pier Amusement Park. The challenging family-friendly course offers traditional Americana figurines. Be sure to bring a camera to take a picture with a tiger, a dancing bear, or humpty-dumpty. Benches are available for those who would like to kick back and enjoy the cool ocean breezes while the children go play. We look forward to seeing who the best golfer is in your family! 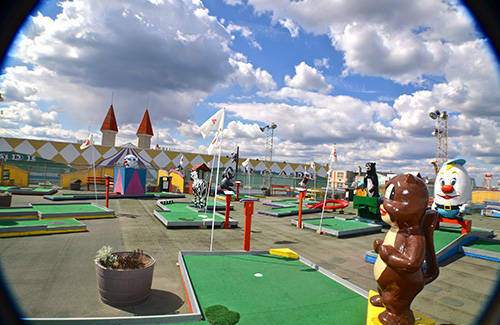 Wacky Rooftop Golf is $7 per player. Golf clubs are available for people of all sizes. The club should be no taller than the waist line. Special small plastic children’s clubs are available upon request. All holes require a “putt” only – golfers should not swing the club higher than their waist. For safety reasons, anyone “driving” the ball will be asked to leave the course. To keep the flow of traffic fun for everyone, we ask that you kindly break up your group if there are more than 5 golfers. You do not have to play the holes in chronological order; a scorecard is available to allow you to play however you see fit and avoid backups. The miniature golf course offers thrills, excitement, and benches to sit – but unfortunately, not much shade. Sunscreen is recommended! Be sure to bring a camera – there are lots of photo opportunities at Wacky Rooftop Golf! The course is only accessible by a staircase. 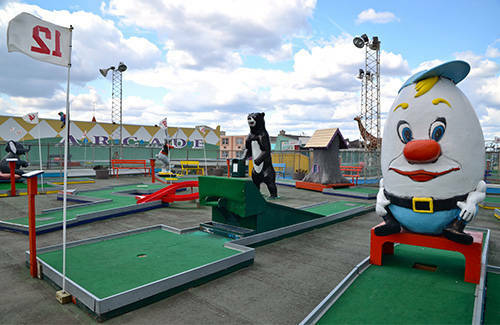 Wacky Rooftop Golf is a great “date night” idea! The attendant is seated at the entrance – they are there to help you with whatever you may need, feel free to ask!